The commercial below revealed the availability will be 10/26/12. Earlier this morning, Microsoft posted some pricing information in their Store, but it was later removed, so we’re not 100% sure if this is final pricing or not. Also keep in mind that this is for the cheaper version ARM-based Windows RT model, not the Surface Pro which will run full Windows 8. 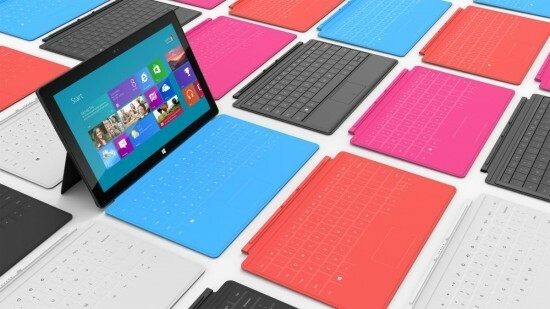 The 10.6″ Surface tablet powered by Windows RT will be priced at $599 for the 32GB version with the Touch Cover, while the 64GB will set one back $699. 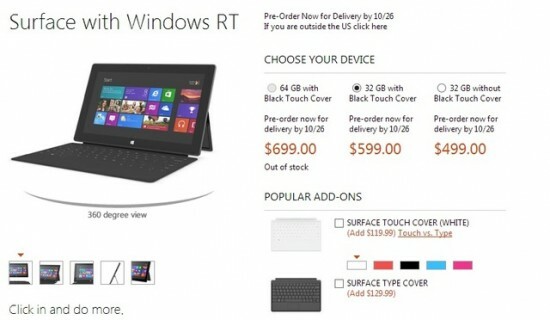 But should you desire the tablet wihtout a Touch Cover you’ll be looking at $499 for the 32GB version. Pricing for the Type Cover (black colour listed only) as an optional accessory has also been revealed to cost $119.99 each, while the Touch Cover has a price tag of $129.99. Unlike the Type Cover, the Touch Cover is available in white, red, black, blue, and purple variants. Also, while watching ABC prime time TV last night, I saw this commercial and was pretty impressed by it!